As a licensed professional counselor, certified coach, speaker, author and facilitator, I have helped my clients improve the quality of their lives. My life’s work has been dedicated to helping people heal, transform, and realize their life goals and vision. I honor the connection of mind, body, heart, energy, and spirit, and it has been both humbling and a great honor to share in the healing journey of so many courageous and wonderful women and men. I employ an integral, holistic approach, mindful of each aspect of the individual. Blending western psychotherapy with eastern philosophy and wisdom, along with the lens of Integrative Medicine, I work with you collaboratively to achieve goals, growth and the healing you seek. I enjoy working with individual and organizational clients, facilitating classes, workshops, groups, and retreats on a variety of topics. I began my career working in county mental health centers, hospitals and treatment centers. I then worked as an employee assistance professional (EAP) counselor and training facilitator, and organizational development (OD) consultant and management coach in organizations. I have extensive training and experience working with people in a variety of settings and roles which allows me to be open, diverse, flexible and understanding in my approach with individual client and organizational clients. I also work extensively with cancer patients/ survivors and their families at Chapman Cancer Wellness Piedmont Healthcare Atlanta, developing and facilitating a variety of programs including but not limited to: Mindfulness training, Mindful Yoga, Integrative Medicine, Stress Management, Writing, Spirituality and Mysticism, Chakra System, and many other classes/workshops. This work is close to my heart and I feel deeply honored to accompany these cancer patients, survivors, and their families on their healing journeys. Every day I am inspired and touched by them. With a Master’s Degree in Counseling Psychology and a Coaching certification from Emory University, I have coached individuals, couples and executives over the past thirty-five (35) years. My goal is to help solve the issues that are keeping clients from attaining their life and relationship aspirations. I am dedicated to providing the highest level of care possible to clients. For individuals, I specialize in health and wellness, anxiety, depression, and stress. I also have considerable success coaching clients with career issues, life transitions, grief, trauma, and addictions. I enjoy coaching and empowering clients with motivation and practical tools. As a coach, I use proven methods and approaches. Each person is unique, therefore I modify sessions to fit their distinctive needs. My commitment is to encourage and assist clients to reach the next level . My approach supports a collaborative rewarding experience. I began my career as a clinical counselor in hospitals and treatment programs. I then spent many years as an Employee Assistance Program (EAP) Manager, and corporate leadership coach and consultant to companies, universities and other organizations. For the past fourteen (14) years, I have been in private practice with my wife and business partner, Angela. I have a passion for helping clients achieve progress in overcoming barriers to their happiness and success. In addition to my private practice, I work at Chapman Cancer Wellness Piedmont Healthcare Atlanta with cancer patients, survivors, and their families. My work with cancer patients and their loved ones includes developing and facilitating integrative medicine workshops, humor workshops, stress management seminars, and groups for couples, men with cancer, and caregivers support. This work is deeply meaningful to me and an integral part of my life’s work. In terms of assisting with other chronic health issues, I have considerable experience working with heart disease and also diabetes. In terms of corporate interventions, I coach managers and executives, facilitate trainings, offer keynote speaking, and conduct mediations between disputing parties. I have presented nationally and internationally on a variety of topics, with mind/body interventions as a specialty. 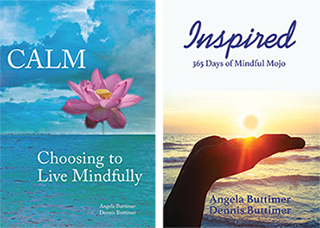 I co-authored CALM: Choosing To Live Mindfully (2011) as well as Mindfulness, Yoga, and Compassion: Clinical Interventions for Stress, Anxiety, and Depression (PESI, 2013). I have appeared as a mind-body expert on CNN and I am a regular healthy living contributor at Huffington Post. I earned my B.A. in Psychology from the University of Georgia (1979) and a Master’s degree in Counseling (M.Ed) from Georgia State University (1981). I am an Emory University- Certified Coach (CHC). I am also a Certified Employee Assistance Professional (CEAP), a Registered Yoga Teacher (RYT) and mindfulness meditation teacher. I am a member of the International Coach Federation (ICF), Employee Assistance Professionals’ Association (EAPA) and Yoga Alliance (YA). I look forward to seeing how I can help you!